My. Favorite. Pieces. Of. Furniture. Ever. They look marvelous and I get compliments on them all the time. Pair them with the matching dresser for the complete look. 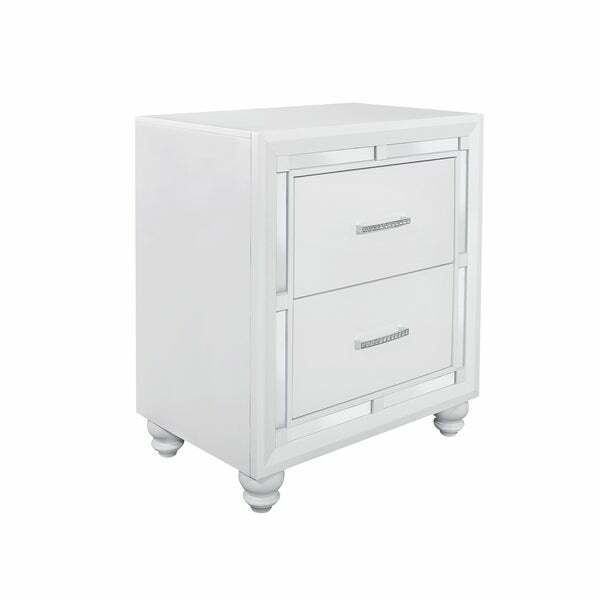 Add the wow factor to your bedroom with this classic contemporary Mackenzie nightstand, finished in beautiful white. This nightstand displays features of bar style drawer handles with crystal embellishment and mirror accents along the trim. Quality craftsmanship in every facet ensures durability and long-lasting wear. To create a stylish and comfortable atmosphere for your sleeping area, this nightstand is the smart choice to further enhance the look of your bedroom. Dimensions 25.0 In. X 16.0 In. X 28.0 In. I love the fact that the top drawer is lined. Some people may not like the fact that the drawers do not roll out on a track but I prefer that, especially for my 8 year old. This ensures she doesn't pull so hard each time, damaging the track. The nightstand matches perfectly with the dresser completing the bedroom set. I love these nightstands. I bought them for my tween daughter and they are perfect. I purchased 2 of these along with the dresser for my daughters room make over. They are extremely well made and though the drawers were not on rollers, they still seem to open and close without any issues. Very happy with the quality and price. This night stand is beautiful! It has a sparkle all over and is the perfect size for my daughters room. It goes with all Her furniture and she loves storing her toys. Stunning piece! I absolutely love this item! I am going to order the second piece and may end up ordering the complete set! This is a modern chic piece that is much larger than the picture, which does not give it justice! Great quality! Looks and feels beautiful! Love that there is nothing to put together - legs on bottom are off but extremely easy to twist in. Beautiful, good value. Not tongue and groove; I was going to remove a star for that but it hasn't caused an issue so I kept it at 5 stars. Bought these for my daughter and they are gorgeous. Very well made! "Is it easy to open the drawers?" The drawers are easy to open. They have center metal drawer glides. "Are these pieces a "lacquered/gloss" white?"